The ‘high season’ of Stove Installation is often referred to as ‘silly’ season amongst industry veterans due to the customer demand for appliances and installations and the coveted Christmas in front of a new burner. Every year at Embers Bristol we experience this rush without fail. The floodgates open from the start of September and we’ll be booking up all the way to Christmas Eve. By planning ahead you will avoid the inevitable ‘silly season’ winter rush. So by thinking ahead you will avoid the rush and when the cold does come, and while everyone else is still ‘curing’ their brand new stove, you’ll be a master in the art of fire building with the right quality wood in stock and generally reaping the benefits of your new fire. You’ll know all about moisture meters, stove pipe thermometers and thermos-electric fans (and they’ll be on your Christmas list ; ). You’ll also have the chance to find a good source of well-seasoned or kiln dried hardwood, and somewhere to store it, before the inevitable rush for firewood begins too. Also In my experience British summertime is not always guaranteed to be, sorry guys, sunny or warm… so on those more chilly mornings or evenings when you really can’t bring yourself to turn on the central heating there is nothing more satisfying then firing up your burner to keep the place cosy. 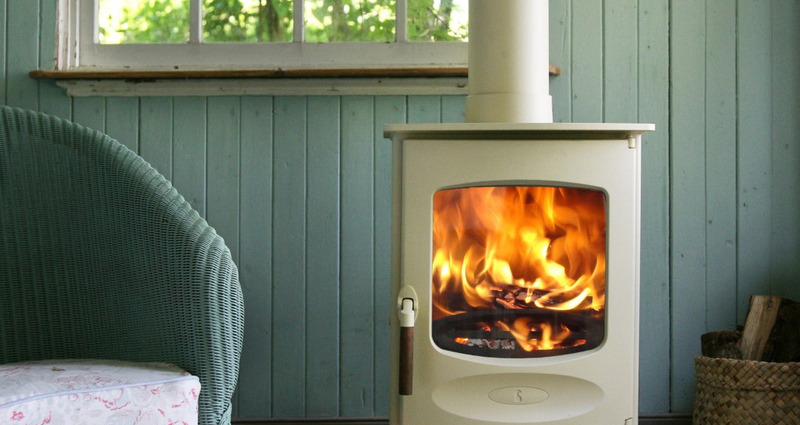 This is certainly the case during autumn and spring as the stove will come into its own as your favourite heat source in your most popular room where you can all huddle around its glowing embers. Check out our Summer Offer 2017 which includes the Charnwood C4 pictured above.